The warm sunshine peeks through the window of the chic conference room as the team sips cups of coffee browsing through spreads of photos that capture stunning Oklahoma weddings. The vibe is upbeat and feminine from the hot pink details in the office to the swooning over a photographer’s latest work. The conversations vary from potential magazine covers to color schemes to the next photo shoot at Oklahoma’s hottest new venue. Of course, there are a few distractions like answering a text message from a spouse or making a note to pick up something for the kids after work. It is exactly where Ashley Bowen Murphy and Kami Huddleston want to be. Ashley and Kami came up with the idea of an Oklahoma-focused magazine more than a decade ago after they were in each other’s weddings (which were two weeks apart!). Both ladies got married in Oklahoma and found it was difficult to plan a wedding with no real guidance from a local resource in choosing venues, wedding gowns, wedding planners – you name it. “People had their close knit referral circles. We just felt there had to be more out there. There was nothing that really showcased Oklahoma weddings and Oklahoma vendors,” Ashley remembers. “There was no way to filter [vendors] to know if they were qualified or not,” Kami says. Over cocktails, the pair daydreamed about designing a wedding magazine and launching a website. Neither Ashley nor Kami had any publishing experience and the advent of blogging as a business was foreign, but it was a conversation they kept coming back to. Kami was a graphic designer and worked in the marketing department at Oklahoma City University, and Ashley was practicing law. They both decided the magazine idea could be a fun project, and with only a few thousand dollars of their own money, they started printing media kits, making business cards and meeting with potential vendor clients. “We just decided we would undertake it and see what came of it,” Ashley says. Kami got busy working on editorial ideas, and the pair set up business meetings. They still vividly remember those first clients with established businesses like BC Clark Jewelers where they boldly asked for a partnership with people who dominated the industry in Oklahoma. “We just kind of wrote our own path,” Kami says. BC Clark agreed to advertise in the fledgling, yet to be born magazine, and the girls were off to the races. Shortly after their own weddings, the pair published their very first issue of Brides of Oklahoma in January 2007. The first issue was a hit! Soon after, vendors all over the state started calling Ashley and Kami wanting to advertise in the magazine. Brides wanted to publish their wedding announcements inside. A couple of years later, the pair hired their first employee, Alli Vaughan, after she had helped with the magazine pro bono from inception while she was still in college. That’s when they also moved from the dining room table to their first four-room office in Oklahoma City. The trio can recall lots of stories about learning the magazine world along the way, like how to get pallets of magazines down six stories at a downtown Oklahoma storage facility! By the next year, they released the first issue of Brides of North Texas. It opened up a brand new market in the Dallas/Fort Worth area. “We knew after we both fully invested ourselves that we wanted to grow and see if we could duplicate the model in another market,” Ashley says. Dallas was not an easy marketplace, and there was a lot of competition with other wedding publications. They hired two more employees to be sales associates in the Dallas/Fort Worth area. They stuck to the model that had immediately taken off in Oklahoma, and it worked. Today, Brides of North Texas is the top performing wedding magazine and local web resource in that market. Ashley and Kami seized the social media revolution as well. They jumped in with making the blog a huge focus — blogging every day about local weddings and vendors, and actively engaging with their audience via social media platforms the bride demographic was using the most. They also focused on their website to make sure it was just as beautiful, image-driven and user-friendly as their magazine. At any time of day, any day of the week, brides-to-be can access the magazine, website or social media channels and browse through endless wedding galleries and editorial features, even filtering photos by color scheme. Everything they discover is 100% local, leading a bride directly to the vendors who can make her dream wedding come to life. “We just worked so hard. It was a labor of love. We don’t do anything the easy way,” Ashley says. That hard work eventually expanded to yet another market in the region. Brides of Austin debuted in September 2015. The company now has more than a dozen employees, and the multi-faceted approach to reaching brides continues with daily wedding emails and online videos showing the making of the magazine and amazing local weddings. When Ashley and Kami daydreamed about their own magazine as twenty-something newlyweds, they never imagined they’d get to one day call their project a successful career. But they were onto something. From sorority houses to hair salons and local bookstores, women flock to the gorgeous bridal magazines these two ladies have poured their heart and soul into and stay connected with their brands through a wide array of online and social mediums, guided by their routine suggestions on vendors and influenced by the amazing imagery presented through every multimedia avenue. 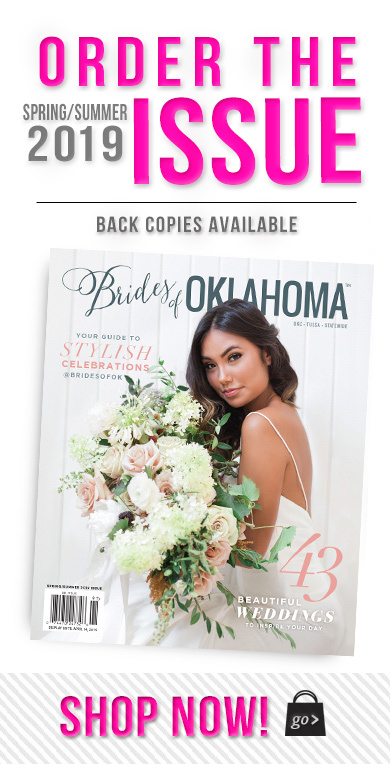 As they celebrate the 10th anniversary of Brides of Oklahoma, they’re proud of their work and thankful for the vendors who support them, especially those who jumped on board from the beginning. “There will always be something special about Oklahoma. We sold (and pretty much everything) ourselves for the first three years. We have a really strong connection to the vendors,” Kami says. “[Brides of Oklahoma] is definitely our baby,” Ashley says. And it is now in Edmond, Oklahoma, in a newly constructed and inspiring, creative workspace, that the pair runs the daily operations of the booming business. They still love every minute of it, from the surreal moment of receiving the latest magazine hot off the press, to bridal shows and wedding gown shoots, to the moments they take every now and then to knock on each other’s hot pink office door and still daydream about the next big adventure in store.